Please, please, please – let’s end this week on a higher note than what we had yesterday. Well, this was a good game – but I bet our champ wishes he had gone bigger on that Daily Double. Because the scores are so close, there aren’t many mind games. If Tracy doubles her score, she’ll have 27,600. To cover this all-in wager, Sam will need to wager 13,200. An incorrect response with that wager will leave Sam with 1,200. To stay above his total, Tracy can wager up to 12,600. Scott can wager up to 12,400. A successful doubling will put Scott at 27,200. To cover this, Tracy should wager at least 13,400. In this case, though, she will lose on an incorrect response, so she might as well wager everything. No point in Sam going for 12,800 with Tracy possibly going all in. 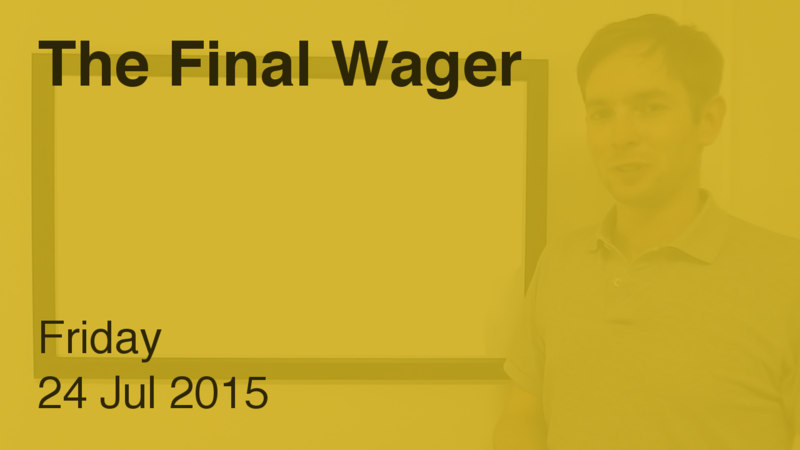 Sam’s wager is fine; if Tracy goes for the bare-minimum $13,401 wager, he’ll win by a dollar. This clue was easy for New Yorkers, who saw ads for this offer constantly in the subway. Scott swept the week (and every Final Jeopardy! clue) and has racked up $108,002. Congrats – and see you Monday!